where rate is the fixed interest rate per period and is a required value. nper is also required and refers to the total number of payment periods overall. pmt is a required value and refers to the payment made each period, and is fixed. pv is an optional value and refers to the present value of an investment/annuity. type is also optional and indicates when payments are due. If type 0 is designated, then this means payments are made at the end of the period whereas if its type 1 that is designated, then this means that payments are made at the beginning of the period. If the type is not entered, then Excel assumes a default value of 0, since this is the real-world standard in most cases. 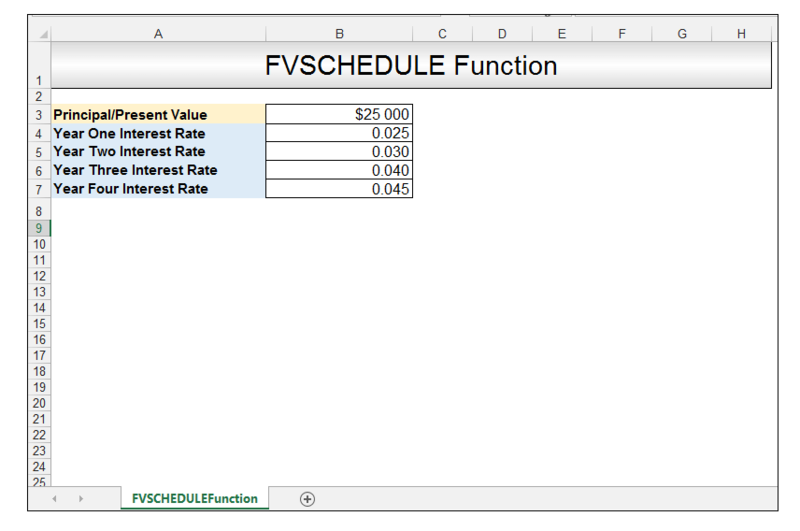 where principal is the present value and is a required value and schedule is a series or array of differing interest rates to apply. 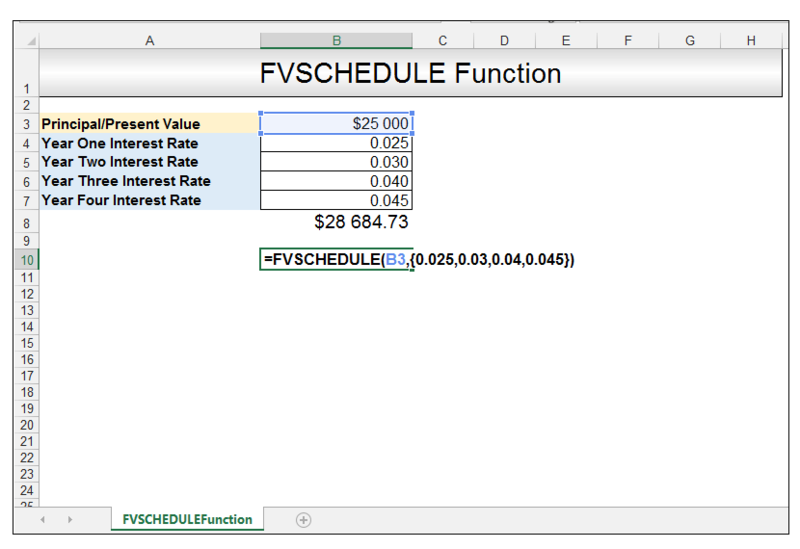 So, let’s get started with a simple example in order to see in which cases, one would utilize the FVSCHEDULE Function. 1) An investment has a present value or principal of $25,000. For year one, the interest rate is 2.5%, for year 2, the interest rate is 3%, for year three the interest rate is 4%, for year four the interest rate is 4.5%. 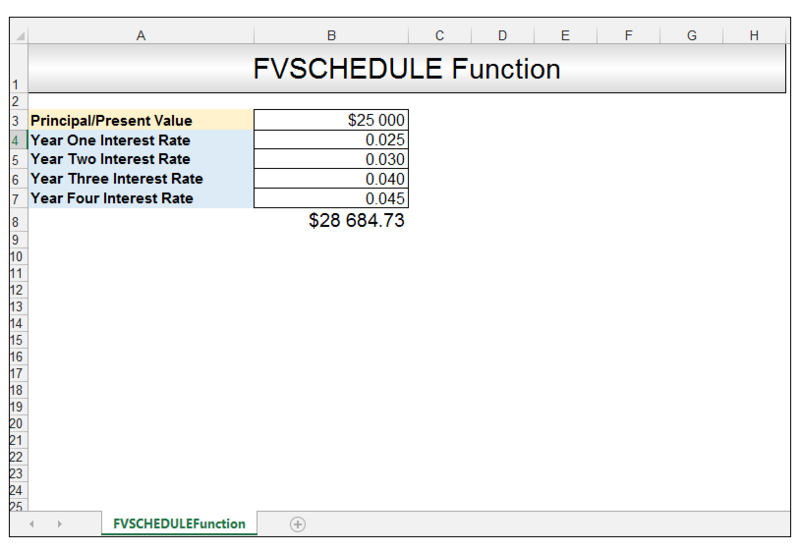 As we can see, in this particular case the interest rate is not constant or fixed, therefore its best to use the FVSCHEDULE Function to calculate the future value. Note, the time periods are all of the equal lengths. 3) Upon pressing CTRL-ENTER, we get the value of $28 684.73, which means that the future value of an initial investment of $25,000, over the four-year period, with interest rates of 2.5%, 3%, 4%, and 4.5% is $28 684.73. Pressing either ENTER or CTRL-SHIFT-ENTER yields the same value of $28 684.73. 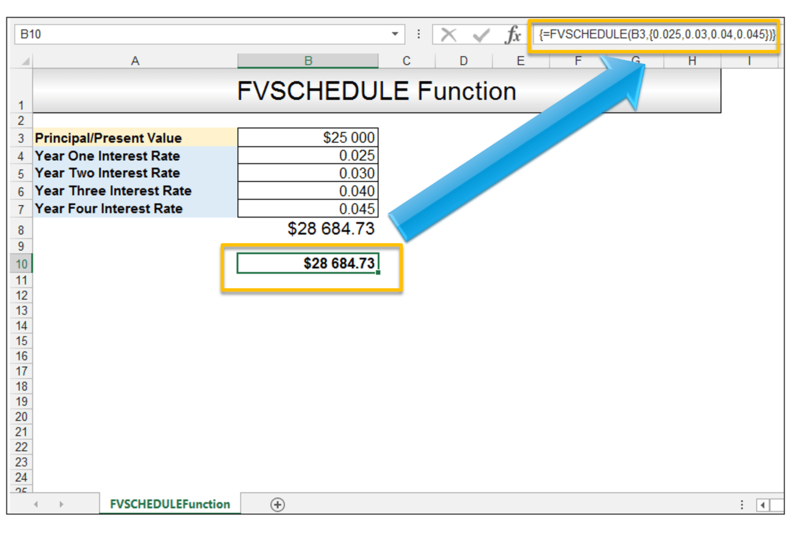 The FVSCHEDULE Function in Excel is a useful function that is utilized to calculate a future value, based on differing interest rates, which are not constant. If the interest rates, however, are constant and one has the information given for nper, pmt and/or pv and type, then one must utilize the FV Function in order to calculate the future value of an investment. 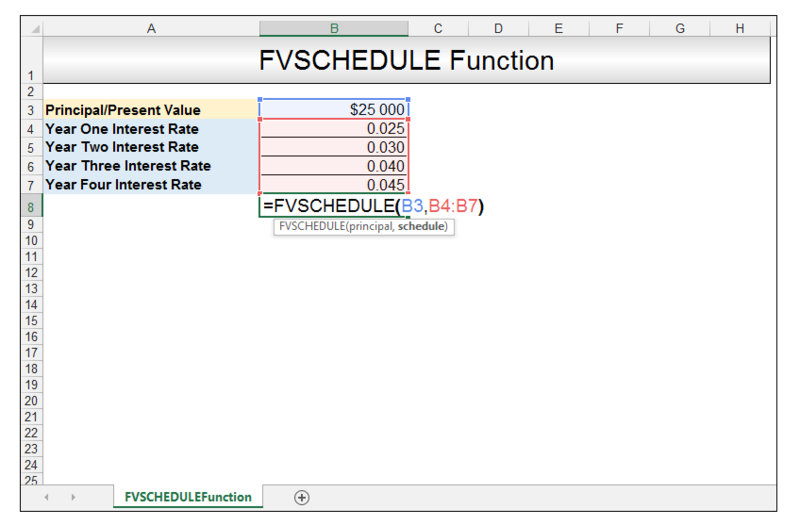 Please feel free to comment and tell us, if you use the FVSCHEDULE Function in your financial spreadsheets. Taryn is a Microsoft Certified Professional, who has used Office Applications such as Excel and Access extensively, in her interdisciplinary academic career and work experience. She has a background in biochemistry, Geographical Information Systems (GIS) and biofuels. She enjoys showcasing the functionality of Excel in various disciplines. She has over ten years of experience using Excel and Access to create advanced integrated solutions. ExcelDemy is a place where you can learn Excel, Data Analysis, and other Office related programs. We provide tips, how to guide and also provide Excel solutions to your business problems. ExcelDemy.com is a participant in the Amazon Services LLC Associates Program, an affiliate advertising program. I earn a small commission if you buy any products using my affiliate links to Amazon. 2018 ExcelDemy.com. All rights reserved.